How Much Do We REALLY Know About Wrong-Way Drivers? Crashes involving wrong-way drivers in the United States are well-documented. Stories of tragedies cover our newsfeeds and televisions practically every day. So it should come as no surprise that 360 lives are lost each year as a result of wrong-way collisions, according to the National Highway Traffic Safety Administration’s Fatality Analysis Reporting System (FARS). Wrong-way accidents are considered the most serious type of collision because of their high-speed head-on nature, leaving vehicles mangled and communities heartbroken. But, do we truly understand why these wrong-way accidents keep happening? The National Transportation Safety Board (NTSB) reviewed statistics from FARS’s six-year analysis of wrong-way driving collisions. Here is what they found. Of the 1,566 wrong-way drivers that were involved in wrong-way driving accidents during the study, 1,111 had alcohol in their system prior to the collision. 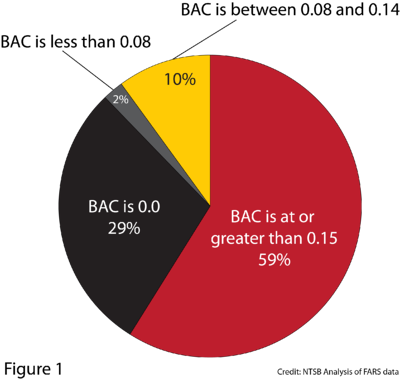 Figure 1 shows the breakdown of drivers where Blood Alcohol Content was reported. An astounding 684 drivers, where BAC was collected, were considered to have extremely high levels at or above 0.15. 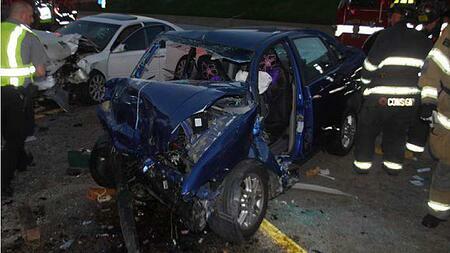 Only 29 percent of wrong-way collisions were caused by drivers not under the influence of drugs or alcohol. What does this mean? States that have serious drunk driving problems leave themselves at risk for wrong-way accidents. Want to know if your state has a drunk driving problem? 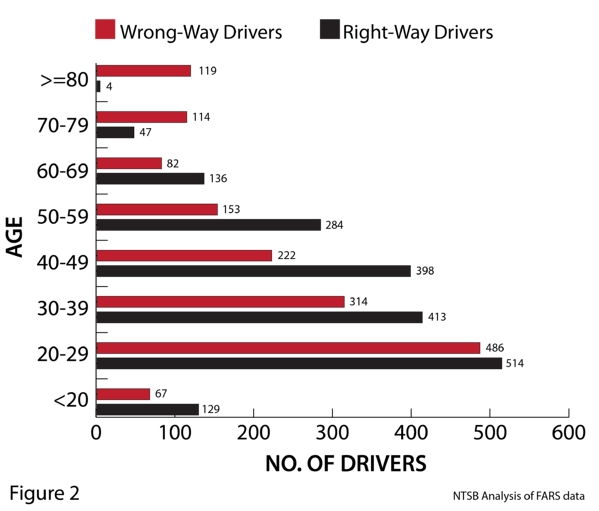 Read our blog Study Ranks Most Dangerous States for Drunk Driving. While alcohol is the main factor for a high proportion of wrong-way accidents, it isn’t the only common denominator. Refer to Figure 2. Most wrong-way drivers were between the ages of 20-50, but in proportion had fewer wrong-way drivers than right-way drivers; those that were victims of the wrong-way driving collision. Of the collisions where alcohol was not involved, a disproportionate amount of accidents were caused by drivers over the age of 70 years old. According to the Centers for Disease Control and Prevention, involvement in fatal crashes per mile traveled begins increasing among drivers ages 70-74 and are at its highest for drivers 85 and older. A number of factors including cognitive function, declining vision and physical challenges can be attributed to an increase in fatal crash percentage within this age group. While a staggering 65 percent of 20-39 year-olds had B.A.C. 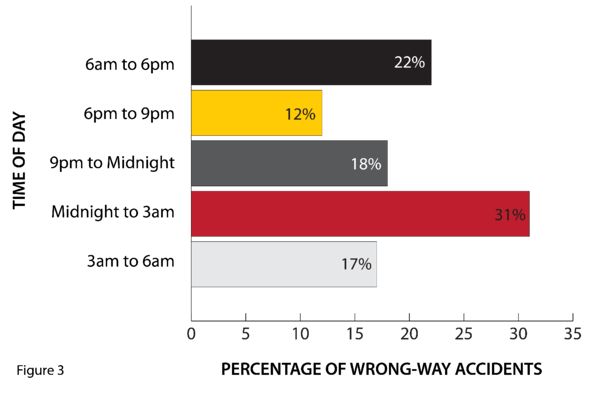 levels of 0.08 or higher, only 8 percent of at-fault drivers 70 and older had B.A.C levels of 0.08 or higher. Difficult conversations need to be had about America’s aging population on its roadways as an estimated 40 million drivers over the age of 65 are expected to be behind the wheel by 2020 according to an older driver fact sheet released by AAA. With alcohol being the main factor of wrong-way collisions, most accidents occur during the nighttime and early morning hours when the general population may be consuming alcohol. Refer to Figure 3. Of the 1,566 wrong-day drivers analyzed in the FARS data, 78 percent of fatal wrong-way collisions occurred between 6 p.m. and 6 a.m. with the highest segment (31 percent) of wrong-way accidents occurring around bar close hours between midnight and 3 a.m.
You are most likely to encounter a wrong-way driver during these hours than any other time on the road. We hope you never have to use these tips but check out 5 Tips on How to Avoid Wrong-Way Drivers just in case. Want to learn more about wrong-way driving and how emerging technology is successfully reducing fatal wrong-way crashes? Check out the TAPCO Wrong Way Driver Detection System.